Great to be back at Ysgol y Deri collaborating with teaching practitioners from across the autism and PMLD sector in Wales. With a focus on Enchantment and the new Expressive Arts curriculum, our first “digital imagining” workshop considered whether co-production could be a viable and feasible method of addressing the digital marginalisation of pupils with profound disabilities. 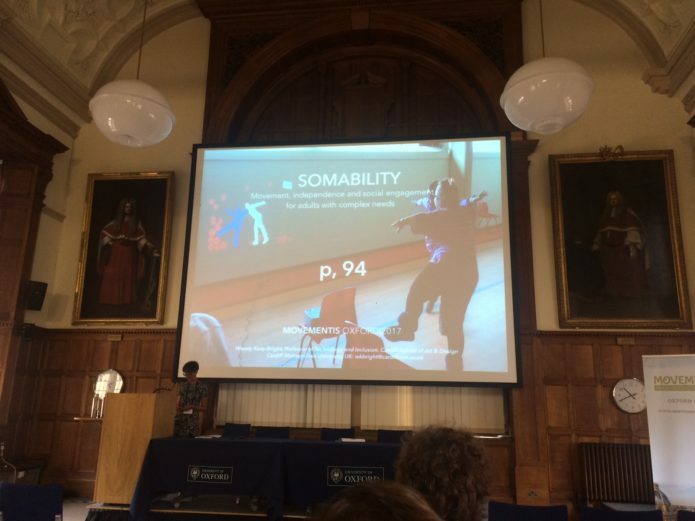 As well as Dancing in Data, Wendy presented a paper entitled: “Somability: movement, independence and social engagement for adults with complex needs”, which reported on the design process and early findings on the Somability project. Even though we created the software back in 2014, there is still a need for playful, responsive interfaces that generate creative agency. This work is now feeding into our new research and collaborations with SEN teachers seeking opportunities to enhance the learning experiences of young people with PMLD within the WAG Digital Competence Framework. Wendy and Lise Hansen presented a paper entitled Conceptualising Kinesthesia – Making Movement Palpable at the European Academy of Design conference in Rome http://www.designfornext.org/index.html. The motivation for the paper, and a new network of collaborators is to reconnect with the sensuous, experiential nature of movement, to visualize data in a move away from the conceptual and concrete towards a more subjective, expressive medium. Rather than perceiving data as remote and dispassionate, we are interested in addressing a gap in the research that considers movement as autotelic, flowing in response to a heightened bodily and kinesthetic awareness. You can read our paper Conceptualising Kinesthesia here. This is an introduction to our new project, which is a partnership with Cariad Interactive, Raspberry Pi, Cardiff Metropolitan University and a number of schools and Arts Organisations, which will be described in regular blog posts. The overarching aim of Somatopia is use the inherent accessibility of RaspberryPi as an inclusive design tool for enabling young people with a wide range of abilities to co-create interactive artworks. Our idea is to generate computing modules that use the RaspberryPi as a creative platform for inclusive, experimental artworks. The unique context for this project, which sets it apart from its competitors, is that it foregrounds participatory design methods, bringing novice developers together with potential beneficiaries throughout the project lifecycle. The outputs of this process are expected to be creative, experimental interfaces that can be scaled to suit any environment. Significantly, these outputs must embody inclusivity, permitting personal and social interaction to emerge through bodily (soma) exploration. At a more ambitious level, when we have fully tested Somatopia with existing partners, we will widen participation in the project by working with local school pupils. Although our primary group would be those studying WJEC (CBAC) GSCE Computer Science or WJEC (CBAC) GCE Computing, we are also interested in widening participation to other subjects and have approached the Heads of two local schools keen to explore inter-disciplinarily collaboration and hybridity. Working with Raspberry Pi, we will test the feasibility Somatopia as a method for enriching the learner experience of inclusivity and accessibility in Human Computer Interaction (HCI). RAatE 2014 is the only UK conference focused on the latest innovations and developments in assistive technology (AT). 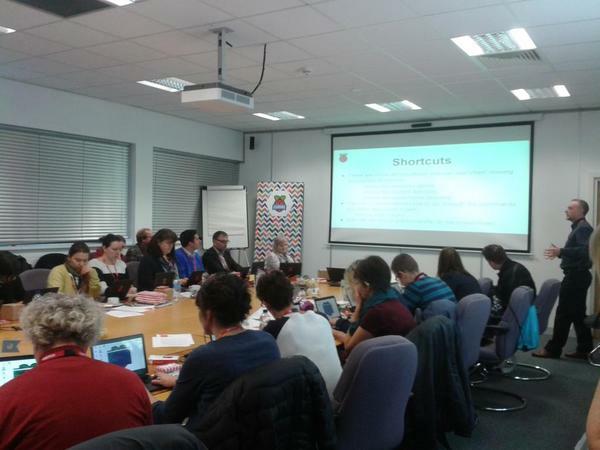 Last week I took part in the first Picademy Wales, thanks to Raspberry Pi, who are funding our new project Somatopia. It was in at the deep end for me as I haven’t touched any real programming since my experiments with Lingo! The Pi team were great, we covered so much ground in two days, but the best thing was getting to grips with the Pi Camera. Thanks to Carrie Ann for the book “Adventures in Raspberry Pi“. This book is great for getting started. More on Somatopia in the next few months but the aim is use the inherent accessibility of RaspberryPi to teach people how to co-create interactive artworks. We will start by migrating some of the most popular aspects of ReacTickles, Somantics, Somability and Somatopia over the RaspberryPi, and then experiment with developing some simple coding modules to allow others to generate their own experimental artworks. Most importantly we will create resources that help people to visualise their ideas. The methods we will demonstrate are based on human centred, participatory design, encouraging novice developers to imagine and test without having to go any where near a line of code. To quote Pete, “Technology is not an idea”. Cariad Interactive are delighted to be working with the Arts Council of Wales, Our Space scheme on an interactive arts project designed for, and with, preschool children. Our project is called Enfys (Rainbow) and the idea is to create a motivating interactive environment for children to explore the themes of colour though rhythmic movement and singing in the medium of Welsh. Camera inputs will capture the actions of the children, which will be output onto a variety of surfaces, large or small, as a sequence of bidirectional, cause and effect, call and response, activities. The Research and Development phase of Enfys is being undertaken with Cylch Meithrin Aberdar and Cylch Meithrin Trelai. Mudiad Meithrin is the main provider of Welsh medium early years care and education in the voluntary sector. Mae’n bleser gan Cariad Interactive weithio gyda chynllun Cyngor Celfyddydau Cymru, Ein Lle Ni, ar brosiect celf ryngweithiol a gynlluniwyd ar gyfer, a gyda, plant cyn oedran ysgol. Enw’r prosiect yw Enfys, a’r syniad yw creu amgylchedd rhyngweithiol ysgogol i blant archwilio themâu lliw drwy symudiad rhythmig a chanu drwy gyfrwng y Gymraeg. Bydd mewnbwn camera yn dal symudiadau’r plant ac yna eu hallbynnu ar amrywiaeth o arwynebau, mawr neu fach, fel cyfres o weithgareddau deugyfeiriad, achos ac effaith a galw ac ymateb. Cynhelir cyfnod cychwynnol y Cynllun, sef ymchwilio a datblygu’r syniad, gyda Chylch Meithrin Aberdâr a Chylch Meithrin Trelai. Mudiad Meithrin yw’r prif ddarparwr gofal ac addysg y blynyddoedd cynnar cyfrwng Cymraeg yn y sector wirfoddol yng Nghymru. Cariad Interactive created interactive backdrops for a unique performance of the Aesop’s fable “The North Wind and the Sun“. Held at the iconic Wales Millennium Centre, the performers – service users and carers from Rhondda Cynon Taf Skills for Independence, together with Dave Morris from the Touch Trust – were accompanied by musicians from the Welsh National Opera. The backdrops set the atmosphere for the performers, acting out the elements, Snow, Wind, Thunder and Sun, as they tried to persuade travellers to remove their multicoloured cloaks. The finale of live music and dance provided us with an opportunity to project ReacTickles to add some multicoloured magic to the party atmosphere. Somantics uses motion sensing and projection technology to recognise and convert gesture into visceral, real-world digital performances. The aim of the work has to produce a suite of ‘tools for expression’ that discover, capture and amplify the communication interests of young people with Autism Spectrum Conditions (ASC) and other related communication difficulties. ReacTickles Magic is one of our most successful and established projects that has grown in harmony with developments in sensor-based interaction and open source programming. The core ethos of ReacTickles Magic is to provide users with a continuous positive feedback loop, so that they easily gain a sense of control and mastery. The software is designed to mirror bodily input through touch, sound and motion. The simple iconic interface encourages a variety of gestural and manipulative inputs, for example repetition, rhythm and pressure, shaking, pressing, tapping, smoothing, dragging, circling. With the addition of sound, an infinite variety of vocalisations can make a direct impression on the graphical output. The Reactive Colours project: demonstrating participatory and collaborative design methods for the creation of software for autistic children.